Neuromuscular expert, Deborah Vogel breaks down understanding functional turnout. It's essential for teachers to understand how hip structure influences a dancer's ability to turn out. I see so many injuries caused by dancers who think turnout has to look a certain way. They try to create it instead of working it accurately from the hip. So, what exactly is the correct degree of a healthy turnout? Based on typical hip structure, most dancers' range of motion will add up to 90 degrees: 45 degrees of internal and 45 degrees of external rotation; 180 degrees is rare. That being said, a ballet dancer will strive for more than 90 degrees (45/45), and that turnout can often be achieved by working correctly. 1. Have the dancer lie on her stomach, legs straight. 2. When she bends one knee up at a 90-degree angle, both hip bones should maintain contact with the ground. 3. Keeping the knee and hip in alignment, let the heel drop slowly over the opposite leg to show the range of turnout. Then let it open away from the body to show turn-in. A dancer's hips won't necessarily have identical ranges. But if there's a significant imbalance, it could be caused by how the student is working. Watch the alignment of her entire body during class. 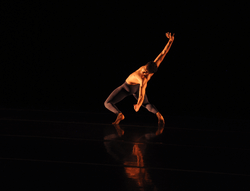 It's common for dancers to test with a range greater than they are able to functionally use when standing. For this, you'll want to help them strengthen their turnout muscles, which many young dancers don't even realize are underneath the big buttock muscles. 1. Lie on your side with your bottom leg straight and your top leg bent, foot flat on the floor. 2. Bend the bottom knee without flexing the hip, so the foot moves back behind you along the floor. 3. Turn out the bottom leg so the foot lifts off the floor. It may only be possible to get to 30 degrees. The movement may be small because you are really isolating those deep muscles. When you test turnout, some dancers will be filled with tension, unable to access their full range. • Pinkie Ball. Have the dancer release tight muscles by working a pinkie ball into the buttocks muscles to find the tight, smaller muscles. • Dynamic stretch. Have the dancer sit in a chair with one ankle crossed over the other knee. Interlace the fingers around the top knee and press the knee down into the hands, while slowly leaning forward over the leg. • Visualization. Have the dancer lie on her side with both knees bent comfortably. Place your hands right on the meat of the buttocks for a tactile cue. Then have her imagine turning in the top leg, rotating the ball of the femur in the hip socket. When she turns in, the turnout muscles naturally release, so imagining this action can be effective in releasing excess tension.